Melrose coach Scott Celli addresses libero Nicole Abbott (white uniform), a senior captain, and her Red Raider teammates during a match. The Melrose girls’ volleyball team trailed Middlesex League rival Woburn, 2-0, entering the third set of Wednesday’s match. Were the Red Raiders finally revealing the impact of graduating four starters from last year’s squad that won the Division 2 North title and advanced to the state final? Not yet. A Division 1 finalist last year after a 22-3 showing, Hopkinton, ranked No. 4 in the Globe Top 20 volleyball rankings, is another winning program undergoing a transition similar to Melrose’s. Sans any seniors on the 2018 edition, Melrose buckled down and roared back from its two-set deficit against Woburn, polishing off an impressive 17-25, 21-25, 25-20, 25-23, 15-13 victory for a 3-0 start. Lily Fitzgerald , a Globe All-Scholastic setter, headlined the list of grads from a 24-3 team. 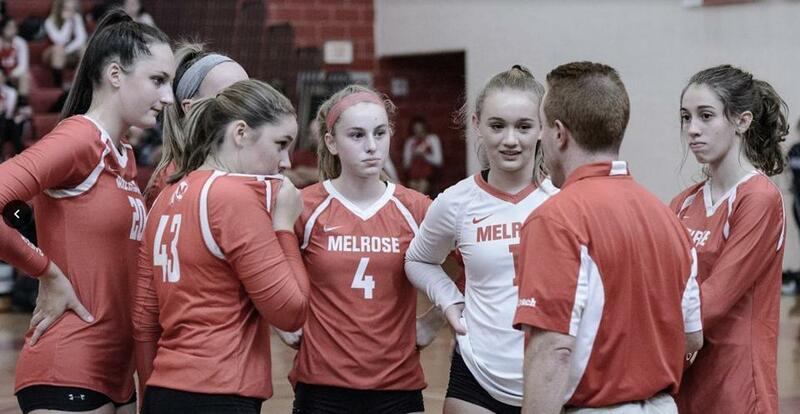 And with no seniors this fall, the Red Raiders are leaning on junior tri-captains Erin Torpey , Emma Randolph , and Nicole Abbott to continue Melrose’s winning culture. But even with the departures the Red Raiders are not rebuilding, just reloading. “A lot of people really stepped up this year,” said Abbott, a 16-year-old libero. “We all basically knew that there were jobs to fill and someone had to fill [them]. I think everyone really went after that . . . All of us came in knowing there was a job to be filled and we had to do our best at it. But, despite those departures, Hopkinton is determined to contend again. “Being able to play against those really competitive girls last year who were on our team definitely was a huge help for the returning players,” said senior captain Jenna Willwerth . The approach is working thus far. Willwerth and fellow captains Lydia Rudden and Mia Ardilla have paced the defending Tri-Valley League champs to a 3-0 start. Sustaining success starts with the youth program. Coach Margie Grabmeier has made a point to establish a connection and cultivate a desire to play with the local kids, running youth clinics and providing practice and game opportunities for middle school players. “The sub-varsity program is really strong,” said Grabmeier. “We have excellent coaches and they’re getting these players ready to play at the varsity level . . . The younger players, they start in elementary school and they’re associating and making connections with these varsity players,” the coach said. Lily Eldridge, Danvers — The setter dished out 61 assists in a 2-1 week for the Falcons, helping to pick up convincing wins over Lynn Classical and Hamilton-Wenham. Emma Fenton, Bourne – The 6-foot-3 senior tallied 42 kills in a 3-0 week as the Canalmen swept Apponequet, Seekonk and Fairhaven. Emily Hudson, Melrose – After racking up 10 kills in her first two matches, the sophomore delivered 16 kills to help the Red Raiders rally from an 0-2 deficit in a five-set victory over Woburn. Teagan James, Barnstable – The freshman setter tallied 28 assists against Barnstable and 29 against Bridgewater-Raynham in a 2-0 week for the top-ranked Red Raiders. Sawyer King Walpole – The senior’s 19 kills helped the Rebels end Newton North’s winning streak in a 3-1 victory. She added 14 more in a dominant sweep of Weymouth. Friday, Franklin at Canton, 4 p.m. – Two undefeated Hockomock teams square off in an early-season test. Monday, Bourne at Case, 6 p.m. – The past two winners of the Division 3 South tournament, the two undefeated sides will battle in South Coast Conference play. Monday, Barnstable at Newton North, 5:30 p.m. – The top two teams in the state square off in what could be a preview of the Division 1 state final. Monday, Hopkinton at Medway, 6:30 p.m. – An early-season battle for Tri-Valley supremacy featuring two undefeated sides. Wednesday, Barnstable at Dartmouth, 5:30 p.m. – A strong Dartmouth squad gets a first look at whether it has closed the gap in the Old Colony hierarchy. Dan McLoone can be reached at dan.mcloone@globe.com.